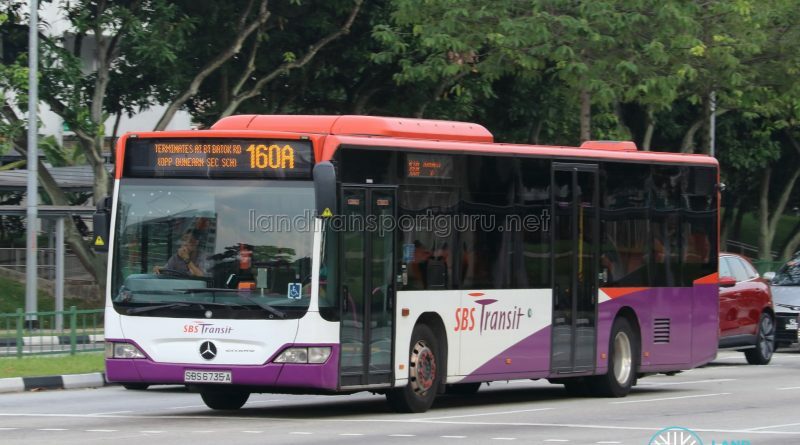 SBS Transit Bus Service 160A is a Short-Trip Service variant of Bus Service 160. The route operates from Jurong East Temporary Bus Interchange and ends at Bukit Batok Road (Opp Dunearn Sec Sch), operating only during the weekday morning and evening peak hours. 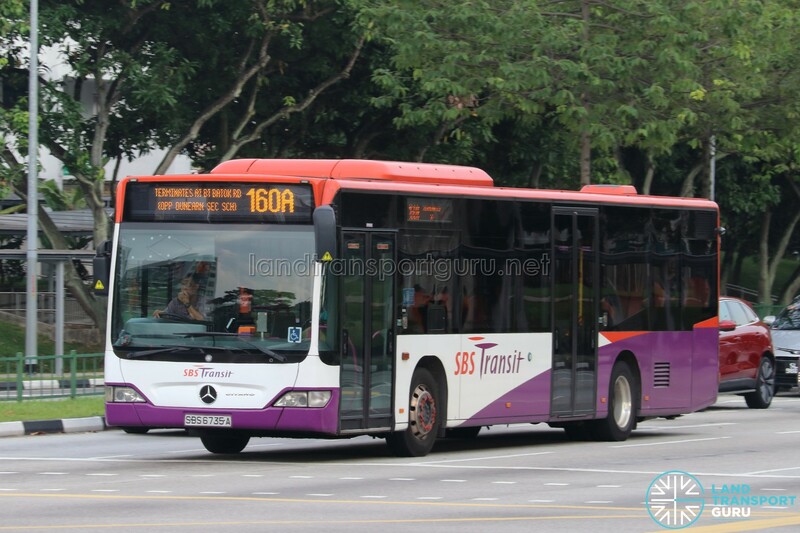 Short Trip Service Service 160A is a trunk service operating from Jurong East Temporary Bus Interchange to Bukit Batok Road (Opp Dunearn Sec Sch). As a Short-Trip Service, the route supplements the local sector of existing Bus Service 160, which is prone to delays from congestion across the causeway. 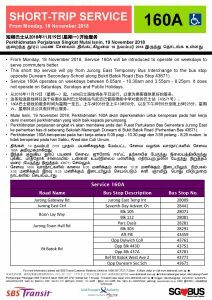 After terminating at Bukit Batok Road (Opp Dunearn Sec Sch), Service 160A buses will turn around and perform return trips of Bus Service 160 towards Jurong East Bus Interchange, starting from Bukit Batok Rd (Blk 402). Introduced on 19 November 2018, Service 160A is wheelchair-accessible at launch. Fare: Charges basic fares for regular trunk services. See Bus Fares. The Bus Service Operating License (BSOL) for this route will be renewed in 2023 under the Bukit Merah Bus Package. 2018 (19 Nov): Launched from Jurong East Int to Bukit Batok Rd (Opp Dunearn Sec Sch), wheelchair-accessible at launch. Yesterday morning, when I was on my way taking bus 160 to ITE, the bus driver suddenly stops at (B07) Opp Dunearn Sec Sch, than he told the passengers to alight this stop as this bus service is 160A, but not 160. The bus driver didn’t change the EDS properly from 160 to 160A making the passengers confused the route. The bus driver should have inform passengers at Jurong East Interchange whether they were going to Bukit Batok. I hope SBS Transit should improve their services (eg: Driver’s Attitude) much better in the future.